That’s a great one. I look forward to reading your mind blowing random thoughts every day! Thanks! It will keep coming! Mar. 30th mind blowing random thought of the day: U.S. Vice President Richard Johnson’s wife Julia Chinn was 1/8th African and therefore considered a slave, inherited after his father died of cholera in 1833. Interracial marriage was deemed illegal, so in public she was kept as his property, but in private they were a couple. Mar. 31st mind blowing random thought of the day: During the Civil War, when the Confederate Amy ran low on ammunition, they raided bat caves for guano, as its high nitrate content provided a key ingredient for the production of gunpowder. I read about that one in a museum when i was in harpers ferry, it was potassium nitrate aka saltpeter as it was known then…that stuff made up about 75% of gunpowders content, the rest was charcoal and sulfur. The sulfur they got from the James, Potomac, and Rappahannock river banks when they dried up and receded a bit. The thing i read said it was used from the war of 1812 right up through World War I.
Lol! I just saw this one on Insta! 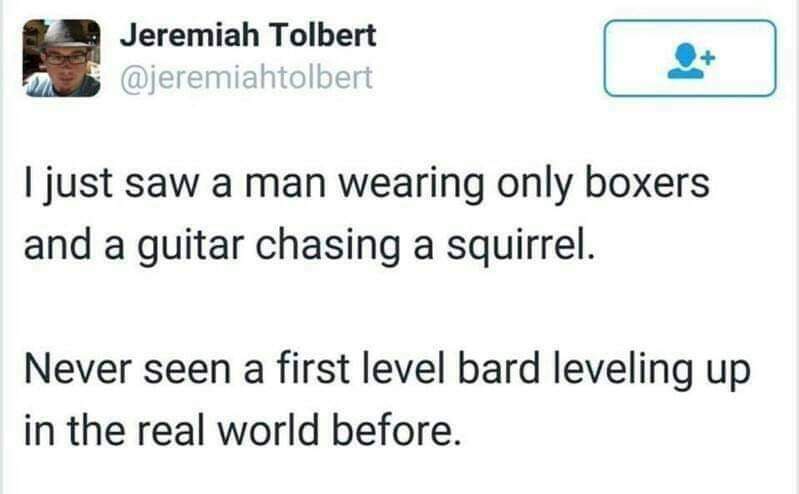 I have a DnD memes page I follow on Facebook! It’s great lol! Apr. 1st mind blowing random thought of the day: On April Fool’s Day in 1957, the BBC broadcasted a fake news report about how spaghetti was grown from trees. As a result, hundreds of viewers called in order to find out more information and asked how to grow a spaghetti tree for themselves. Apr. 2nd mind blowing random thought of the day: Saturn, a Mississippi alligator born in 1936, was brought to the Berlin Zoological Garden in Germany as a personal gift to Adolf Hitler, who reportedly enjoyed frequent visits to the zoo, and as a result, Saturn was nicknamed “Hitler’s pet.” After WWII, British soldiers discovered the alligator and gave it to the Soviets in 1946. Still alive today, Saturn currently resides in the Moscow Zoo as one of their most famous and popular attractions. Just like the radio broadcast reading of War of the Worlds. People literally thought Earth was being invaded. Apr. 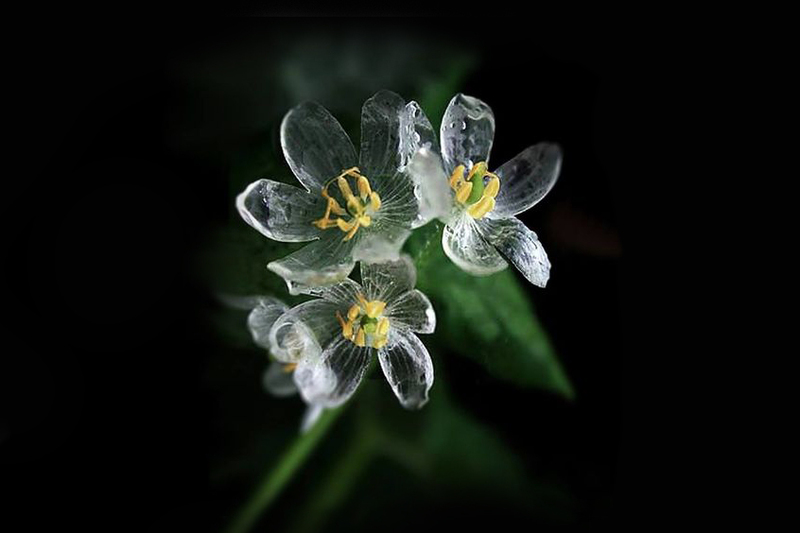 3rd mind blowing random thought of the day: Skeleton flowers have such delicate petals, they become transparent when it rains. Maybe it’s just because it’s cloudy and they’re wearing Transitions. One year on Mercury lasts 88 earth days. Does that mean you would be older, younger, or the same age on Mercury? You would have to go by your Mercury Age. I am 33.5 years old on Earth. On Mercury I’d be 139.5 years old. But, even if you were able to somehow live on Mercury without dying from the high Hydrogen content in the atmosphere. The temperatures would absolutely kill you. During the day, temperatures on Mercury’s surface can reach 800 degrees Fahrenheit ( 430 degrees Celsius). Because the planet has no atmosphere to retain that heat, nighttime temperatures on the surface can drop to minus 290 degrees Fahrenheit (minus 180 degrees Celsius).